On 15 October 2013 Russell Downey, a great nephew of Christopher and Charles Gage, placed a poppy beside their names on the Roll of Honour at the Australian War Memorial. In doing so he paused to wonder what these two men looked like. No photographs of them had been found to date. Amazingly, this changed only a few days later when on-going research by Russell’s wife Gayle, located a photograph of Charles Gage in the pages of the Forbes Advocate. A striking family similarity to Frederick Clinton Gage who served in World War Two (shown on Ancestry.com) a younger brother of Christopher and Charles, is immediately obvious. So this goes a long way towards granting Russell’s wish. Both Christopher and Charles Gage are named in the survey of Aboriginal men who were ex-members of the AIF published in the RSSILA (now RSL) journal Reveille in 1932. They were the sons of Christopher and Mary Gage, nee Sloan of Eugowra, New South Wales. Charles volunteered for service in the first AIF on 11 March 1916 and Christopher on 4 April the same year. Both lost their lives. The shock of losing two sons led to the mental collapse of their father who never recovered from their deaths. Charles Gage was killed on 3 December 1916 only days after arriving in France and transferring to the 56th Battalion. His death was described in the Western Champion by a fellow soldier, Frank Reid. They were marching into the firing line on the night of December 3rd, and when 100 yards off the trench shells were falling all around them. One burst and killed a number of men, among them Gage. Frank Reid was also wounded by a shell burst which followed. in good health and ” In the thick of the fray.” His company was doing good work, notwithstanding that they were fighting against big odds and under trying and uncomfortable circumstances. Corporal Gage was bold enough to say that he did not think that the war would last much longer. Corporal Gage is a son of Mr and Mrs C.H. 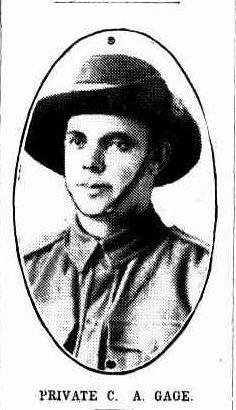 Gage, of “Pine Vale,” Eugowra, and a brother of Private Charles Gage, who was killed in action recently. Following five more months of war on 24 August 1917, in a further letter to his father published by the Forbes Advocate, Christopher was not so optimistic. After giving news of some of the ‘Eugowra boys’ he concluded by saying ‘they had been having a good time lately, but did not think it would last long as “good things didn’t last long in France!” ’. By this time Gage had been on the Western Front all year, and experienced the death of his brother. One month later he himself was dead – killed in action on 26 October, the date of the 54th Battalion’s major battle at Polygon Wood. The Gage brothers’ Aboriginality was located in the Wiradjuri of the Lachlan river via their mother Mary Sloan, whose Sloan family is recorded as in receipt of an individual reserve near Eugowra. Unlike some other Indigenous volunteers, the Gage brothers did not grow up on a managed Aboriginal station like Warangesda or Erambie or live in a reserve community. The newspaper reports relating to their war service make no reference to Aboriginality and give no indication that their family – Eugowra farmers – were not accepted in the community. Moreover, while technically under the control of the Aborigines Protection Board and noted by the Board in the information given for the Reveille article, practically this was not so. Their case is not isolated and just one example of the fact that a great variety of backgrounds are shared by men of Indigenous heritage who volunteered for the AIF. These range from mission to farm, urban to country town and outback station and more. This information can be found in the service records of these men which are digitised and available online at the National Archives of Australia. The names of identified Indigenous volunteers are listed in Aboriginal and Torres Strait Islander Volunteers for the AIF: the Indigenous Response to World War One. My thanks to family historian Gayle Downey for telling me of her discovery of the photograph of Charles Gage.